We at FIREBREW Bar & Grill are big fans of pizza—so much so that we happily offer many different, fresh pizzas for you and your family to enjoy. Each of our pizzas is made in house, and all of them are cooked to perfection in our open-deck fire oven. Each pizza is a delicious combination of sauces and toppings, and we know you can’t go wrong no matter which pizza option you choose. If you are ready to experience a pizza that truly reaches the next level, stop into our restaurant for lunch or dinner! For those of you who are curious about the history of one of our favorite dishes, then read on to learn more! In the 1700s and 1800s, Naples was technically an independent kingdom that was known for its large numbers of poor and working class people. In fact, the closer to the water you were, the denser the population was. Some family lived in spaces that were just the size of a room. The people needed cheap food that could be eaten fast. Flatbreads with different toppings—otherwise known as pizza—met this requirement with relative ease. The wealthy of the time judged the lower class for eating these early pizzas, even though they were topped with several toppings that people still love today, such as tomatoes, oil, garlic, and cheese. Once Italy unified in 1861, King Umberto I and Queen Margherita paid a visit to Naples. According to stories and legends, the royal couple became bored with their eating patterns and were curious about the pizzas from the city. As most pizza eaters can attest to, they instantly loved it. The queen’s favorite was a pizza made with white cheese, red tomatoes, and green basil. From that point forward, this pizza flavor has been called Margherita. The queen’s approval of the dish may have been the start of a pizza craze across all of Italy! While enthusiasm grew within the country, no one outside of the Italians had experienced this delicious dish. However, in the 1940s, our beloved pizza began to really spread past Italy’s borders. Once Italians began to immigrate to the United States, this delicious dish spread quickly. They began making these reliable meals in New York, Chicago, Boston, St. Louis, Trenton, and other large cities. While these people came for working opportunities, and not culinary ones, non-Italian people were still fascinated by this new, delicious food. The first documented pizzeria in the United States was G. Lombardi’s, which was located on Spring Street in Manhattan. It is still in operation today, but no longer at its old location. Of course, locals will still argue today about where to find the best pizza! Italian-Americans’ dish of choice soon became a staple in America. It was no longer viewed as an “ethnic” treat, and it soon became one of the most popular and common dishes in the country. Before long, non-Neapolitan varieties of toppings emerged to create different twists on a classic food. Now, you can find pizza with everything from barbecued chicken to smoked salmon piled on top! These creative topping combinations soon spread outward from America, and now countries all over the world choose pizza toppings that are unique to their own tastes. We have heard of Gouda cheese in Curaçao all the way to hardboiled eggs in Brazil for toppings. 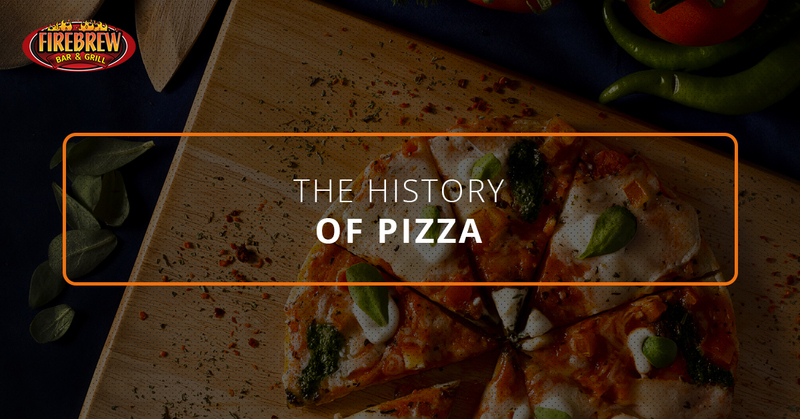 Pizza has a rich history, and we are proud to be a part of it. At our restaurant, we offer quirky favorites and classics, such as six cheese pizza, Margherita pizza, BBQ chicken, cheeseburger pizza, Chicago-Southside style, veggie, and a variety of flatbreads. If you are ready to experience freshly-cooked pizza made right in front of you, then it is time to stop by at FIREBREW Bar & Grill! We know how important it is to have a meal that fits your needs and your family’s, which is why we have something for everyone. Swing on by tonight and experience the difference that we can provide! If going out for lunch is more of your style, then please stop by. We offer happy hour specials that cannot be topped, including a self-service wine bar. Let us delight you and your guests with one of the freshest meals you have ever had!